This post continues the description of my presentation at the SciTech Conference in San Diego on 5 January 2016. 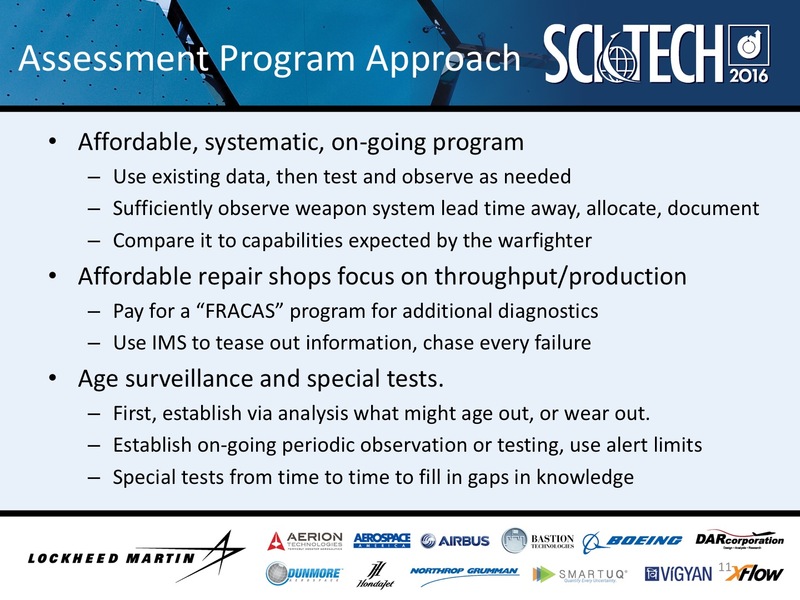 One point I made when this chart went up was that every sustainment organization must be able to observe the weapon system to be able to tell if the organization is maintaining the capabilities baseline. That is, is the sustainment team keeping the warfighter happy? Is the weapon system reliable? Available? Effective in its mission? To be able to continuously monitor the entire weapon system could quickly become unaffordable. But there are a few tricks to keep costs down. Number 1, use the data that is automatically created every day. An obvious piece of data most sustainment organizations look at is sortie rates, for instance. Are you finding all useful data? Number 2, your repair depot (or more likely depots) is incentivized to fix your weapon system quickly and affordably. But you need them to also tell you how it is doing. Do not hesitate to enter into a contract with them to get data for money. There will be much more coming on this topic under the title: “Closed Loop Failure Analysis”. Number 3, now that you’ve found and used all the less expensive data, it is time to set up programs to get the rest. What are your weapon system’s failure modes? How will it wear out? Are there parts that will age out? Some of this information comes from design data, other comes from use, maintenance, and repair data — if you are paying attention. A surveillance program can be built around this data in order to track degradation and predict future issues. Number 3+, there will always be the need for special tests. These will deal with gaps in your knowledge that start to become apparent as all the other data is analyzed. Many sustainment organizations divide their weapon systems into parts to ensure full and thorough coverage. For instance, one sub-organization may cover the power plan while another sustains all the software. How this is divided is important to ensure nothing “falls between the cracks” of organizational responsibilities. More on that later under the title: “Integrated Product Teams”. Without a thorough assessment program, the organization is blind. If it is not affordable, required cutbacks will reduce your organization’s vision.